On Wednesday last week we held the second meet up of the London Facebook React User Group. 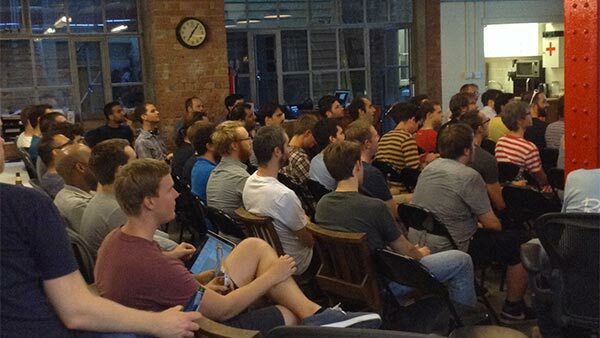 We had a fantastic turnout this month, with roughly 80 people packing into Red Badger’s office in Shoreditch. There was a broad range of talks throughout the evening. Stuart Harris kicked off proceedings with a 10 minute intro to React in response to feedback we had from last time. This led on to an in depth look on what’s new inReact 0.11 and a look at how to improve performance in your app using React’s new diagnostic tools (slides here). Next up was Alex Savin with a convenient Segway on to improving React performance with persistent data structures using Morearty (slides here). Forbes Lindesay led on to tell us about his latest project Moped. A framework for building real time isomorphic applications in React. Our final talk was from Viktor Charypar who was able to proudly show off Red Badger’s work with Sky, an isomorphic React application built with Ruby on Rails. For all these talks and more, hit the youtube link below. Hopefully this meet up will continue to be more popular, and if so we might need a bigger venue! You can keep up with the latest announcements here, and we are always looking for more speakers so if you want to do a talk, no matter the length, then please do let us know.